What I Like to Eat: Leaves, stems, grass roots, weeds and forbs, which are flowering plants. We on occasion eat small animals like grasshoppers, bugs and beetles. Betcha Didn't Know This About Me: We are referred to as a "keystone" species because we bring so much more to animal kingdom table of the than just our furry good looks. It means we are great for the ecosystem and build habitats for more than 100 other animal species. The Answer to the Question We Are Most Asked: We aren't canines. We are rodents. Duh. What's In a Name: Since we are rodents, you might wonder why we are called dogs. Well, this name came from settlers crossing the plains who heard our warning cries and mistook them for dog barks. 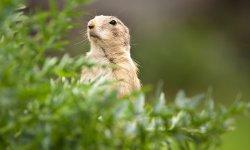 Family Structure: The black-tailed prairie dogs are the most common us and are the only species found in North America. We are social butterflies and live in family groups called coteries. Coteries contain one adult male, a few adult females and the children. Groups of coteries are called neighborhoods or wards, and these groups make up a colony. Home Is Where the Heart Is: We are great builders and can construct tunnels with raised entrances and several different openings. Just like in your home, each tunnel has separate rooms which we differentiate for activities like sleeping, raising our young, eating, and going to the bathroom. Endangered: We are not on the endangered species list, but our numbers have immensely declined by about 95% over the last 150 years. We've been reduced from a population of hundreds of millions to tens of millions. My Biggest Predators: Another reason we are called a keystone species, is because we ourselves are a food source for eagles, coyotes, bullsnakes, rattlesnakes, lynx and badgers. Gulp. Submit Your Kiss Cam / Cuddle Cam Video!